IN this department are printed letters from readers on various scientific and related topics. It matters not whether your letter is complimentary or whether it is a brickbat, we will publish it just as readily. We want your comments—your opinions—on topics connected with this magazine. No attention will be paid to unsigned letters, nor are letters answered by mail. Worth-while letters are published here every month. Address Editor, Science Forum, EVERYDAY SCIENCE AND MECHANICS, 100 Park Place, New York City. Although I am not a subscriber to your magazine, I never miss a copy of it at the newsstands. Your mag is one of the best on the market, and yet there are ways of improving it. To be a radio operator, set builder, service man , or what have you, you must have patience, We, the radio hams of the United States, have been patient long enough while you let the greedy chemists hog all the articles. For the last four or five months I haven’t seen a worth-while radio article, while look at those good ones that were published last year. The photography section is excellent, if you would only keep it up. Your “Science Forum” and “Eccentricities of the Eye” are very good, though I frequently read the advertisements first. SILVESTER ZAIKIS, South Boston, Mass. 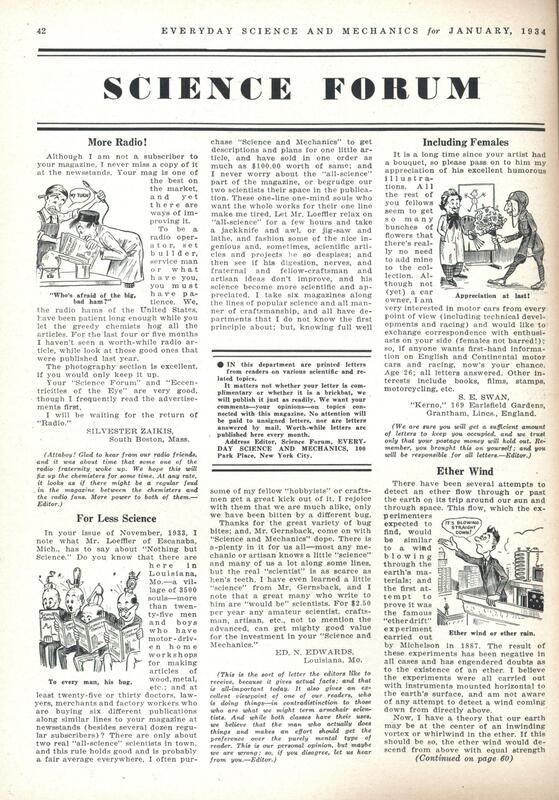 In your issue of November, 1933, I note what Mr. Loeffler of Escanaba, Mich., has to say about “Nothing but Science.” Do you know that there are here in Louisiana, Mo.—a village of 3500 souls—more than twenty-five men and boys who have motor-driven home workshops for making articles of wood, metal, etc. ; and at least twenty-five or thirty doctors, lawyers, merchants and factory workers who are buying six different publications along similar lines to your magazine at newsstands (besides several dozen regular subscribers) ? There are only about two> real “all-science” scientists in town, and this rule holds good and is probably a fair average everywhere. 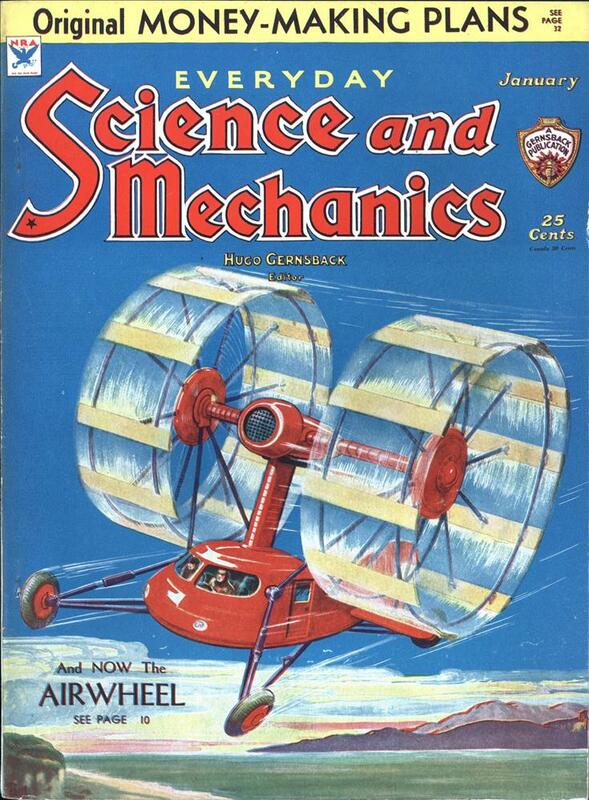 I often purchase “Science and Mechanics” to get descriptions and plans for one little article, and have sold in one order as much as $100.00 worth of same; and I never worry about the “all-science” part of the magazine, or begrudge our two scientists their space in the publication. These one-line one-mind souls who want the whole works for their one line make me tired. Let Mr. Loeffler relax on “all-science” for a few hours and take a jackknife and awl, or jig-saw and lathe, and fashion some of the nice ingenious and, sometimes, scientific articles and projects he so despises; and then see if his digestion, nerves, and fraternal and fellow-craftsman and artisan ideas don’t improve, and his science become more scientific and appreciated. I take six magazines along the lines of popular science and all manner of craftsmanship, and all have departments that I do not know the first principle about; but, knowing full well some of my fellow “hobbyists” or craftsmen get a great kick out of it, I rejoice with them that we are much alike, only we have been bitten by a different bug. ED. N. EDWARDS, Louisiana, Mo. It is a long time since your artist had a bouquet, so please pass on to him my appreciation of his excellent humorous illustrations. All the rest of you fellows seem to get so many bunches of flowers that there’s really no need to add mine to the collection. Although not (yet) a car owner, I am very interested in motor cars from every point of view (including technical developments and racing) and would like to exchange correspondence with enthusiasts on your side (females not barred! ); so, if anyone wants first-hand information on English and Continental motor cars and racing, now’s your chance. Age 26; all letters answered. Other interests include books, films, stamps, motorcycling, etc. S. E. SWAN, “Kerno,” 169 Earlsfield Gardens, Grantham, Lines., England. There have been several attempts to detect an ether flow through or past the earth on its trip around our sun and through space. This flow, which the experimenters expected to find, would be similar to a wind blowing through the earth’s materials; and the first attempt to prove it was the famous “etherdrift” experiment carried out by Michelson in 1887. The result of these experiments has been negative in all cases and has engendered doubts as to the existence of an ether. I believe the experiments were all carried out with instruments mounted horizontal to the earth’s surface, and am not aware of any attempt to detect a wind coming down from directly above. Now, I have a theory that our earth may be at the center of an inwinding vortex or whirlwind in the ether. If this should be so, the ether wind would descend from above with equal strength at all points on the earth’s surface and penetrate through to a common local point at the center. The product resulting from this meeting is another story; but one of the effects would be a rotational push imparted to the earth, due to the spiral course of this inwhirling ether wind. Another effect would be what is known as gravitation, caused by all objects offering more or less obstruction to this wind and thereby being pressed to the earth’s surface; in a manner analogous to a Kansas wind which holds the farmer’s hat firmly on the side of the house for hours at a time. To detect a wind such as this it would be necessary to set the interferometer in a vertical position or nearly so, and I am desirous of having this tried or knowing if it has been tried.